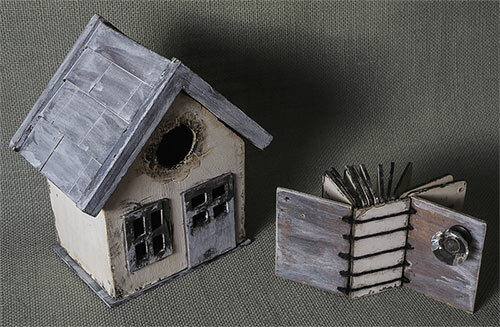 Last week Oola and I went to a meeting/show-and-tell at the Book Arts Guild in Seattle. 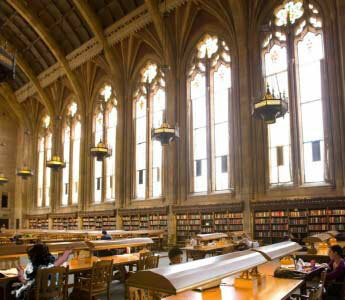 The meeting itself was held in the amazing building — the Suzzallo Library, University of Washington. 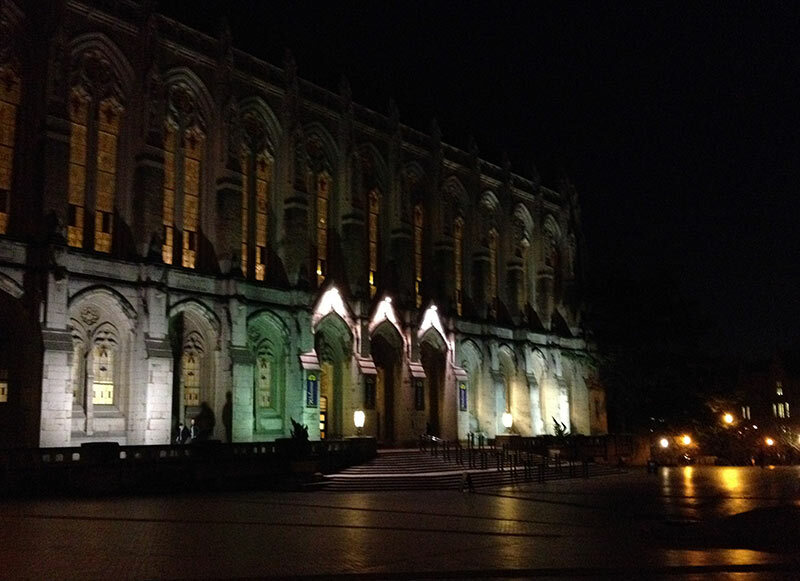 We got there after dark so there are not many picts but you can see more of this architecture, including the part sometimes known as the Harry Potter room, at the University of Washington site. Allow me to say that Book People are the greatest. Several shared their projects at the meeting. I can share only a few of them with you. 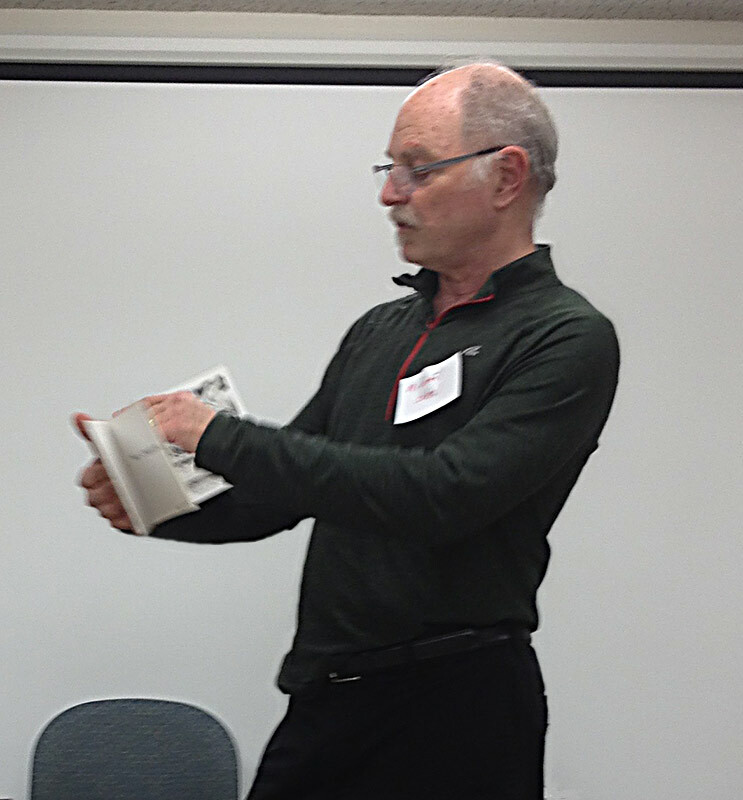 Here is Don Myhre holding one of his wonderfully hand-crafted, one-of-a-kind books. This one is made of broken up bits of cell phones. You can see more of his delightful books at Vamp and Tramp. 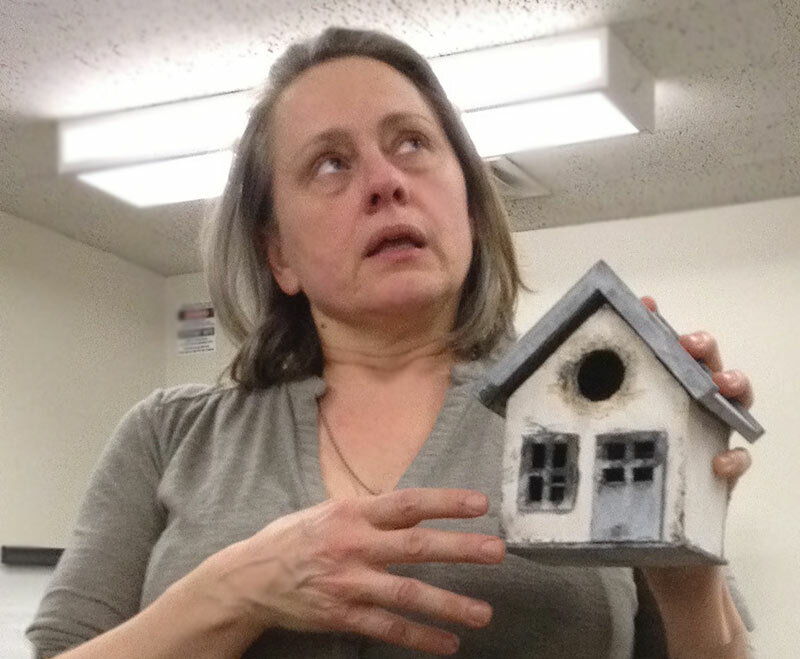 Lisa Hasegawa is a printer with a warm smile and a self-effacing sense of humor. She runs Ilfant Press in Seattle. She is part of a postcard exchange with several other letterpress people. Each member of this group produces a postcard a month to exchange with the others. Here is a close-up of her postcard about “Lady” problems. On Lisa’s wrist is tattooed the word “printer” — upside down and backward, of course! A little joke for those of us who have had the thrill of setting type. Carl Youngmann and Ellie Matthews run the The North Press in Port Townsend,WA. They brought some exquisite typeset projects. Here is an image they showed from one of their projects. 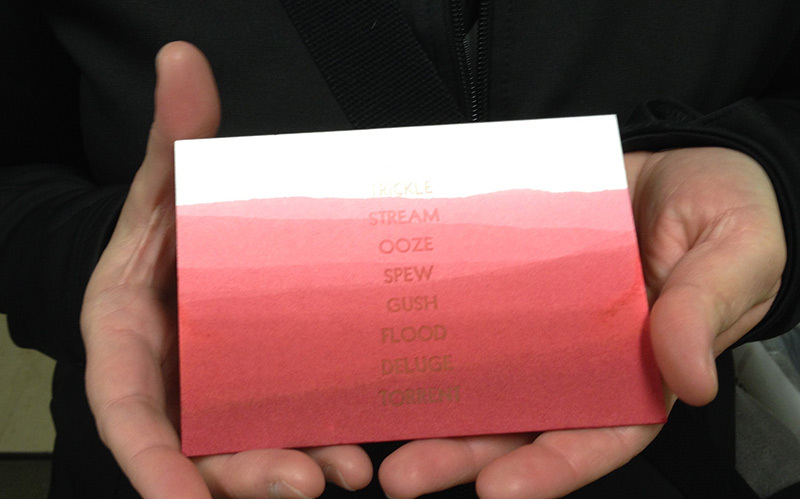 Anjani Millet talked about her artist book that jumped right into my heart. This is the story of Anjani’s mother and a battle with Alzheimer’s. When they moved mother from her beloved home and the black mold that inhabited that house her memory got better and she was un-diagnosed from Alzheimer’s disease. 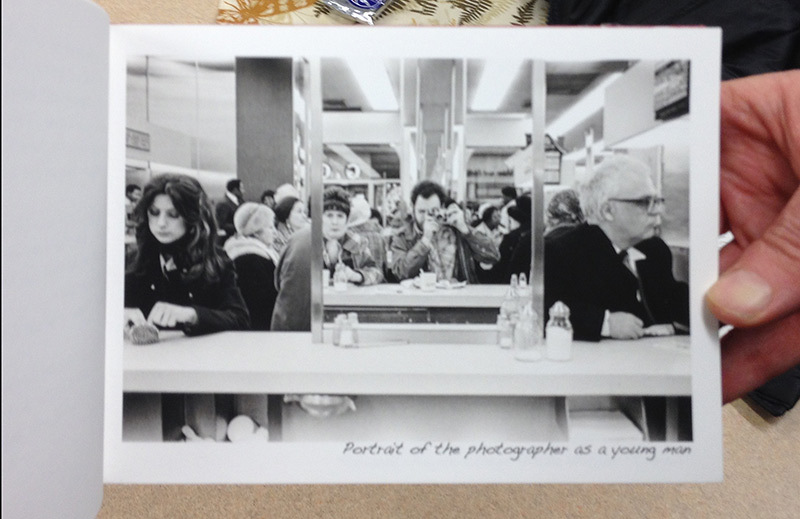 Michael Sobel showed a book of photographs he took in 1969. One page from Michael’s book of photographs, printed as digital inkjet images. Really nice photo, Michael. Where is your website so we can see more? Or did I get your name wrong? 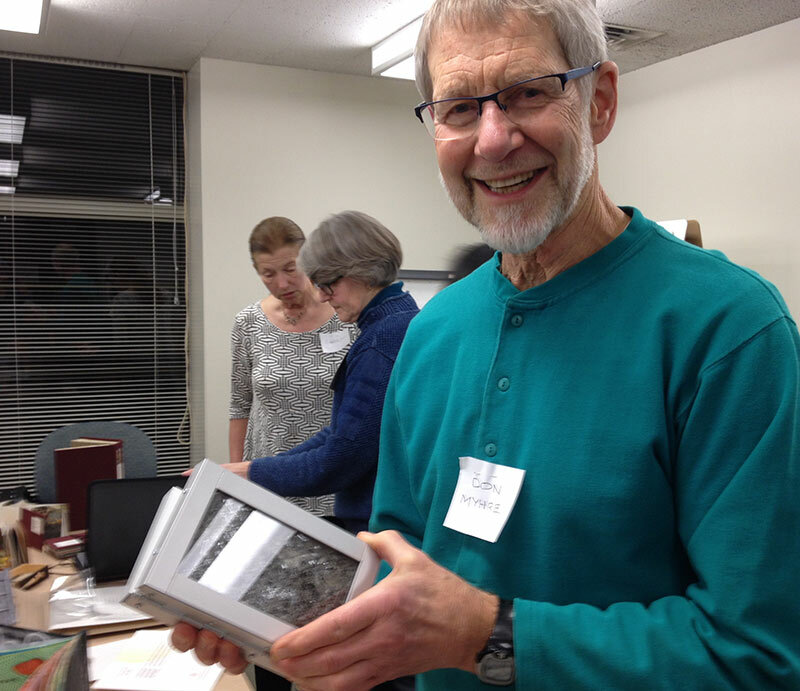 Ed Marquand brought some high powered volumes designed and produced for museums, publishers, artists, and collectors by Lucia/Marquand in Seattle. Check him out to see some top notch work. Ed is also one of the instigators of “Mighty Tieton”, an arts incubator in the town of Tieton WA. 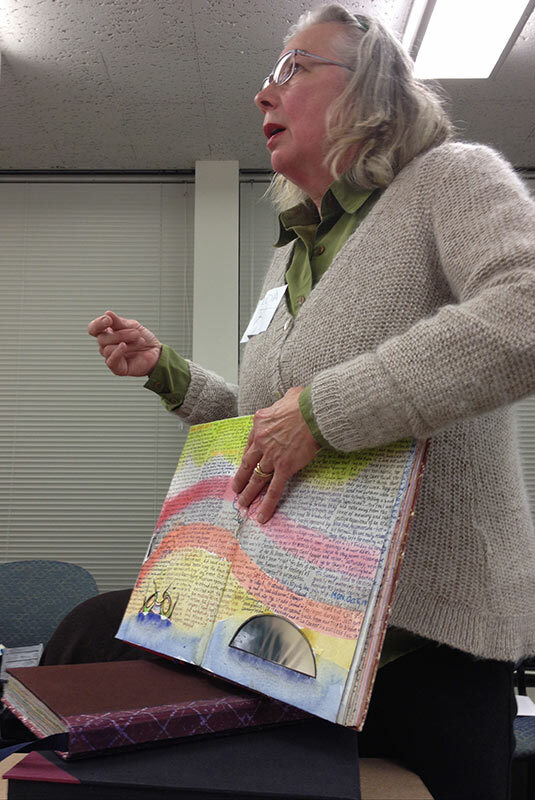 Claudia Hollander-Lucas, educator, visual artist and writer brought her Vade Mecum rant book. An eye popper filled with time holes and textual atmosphere. 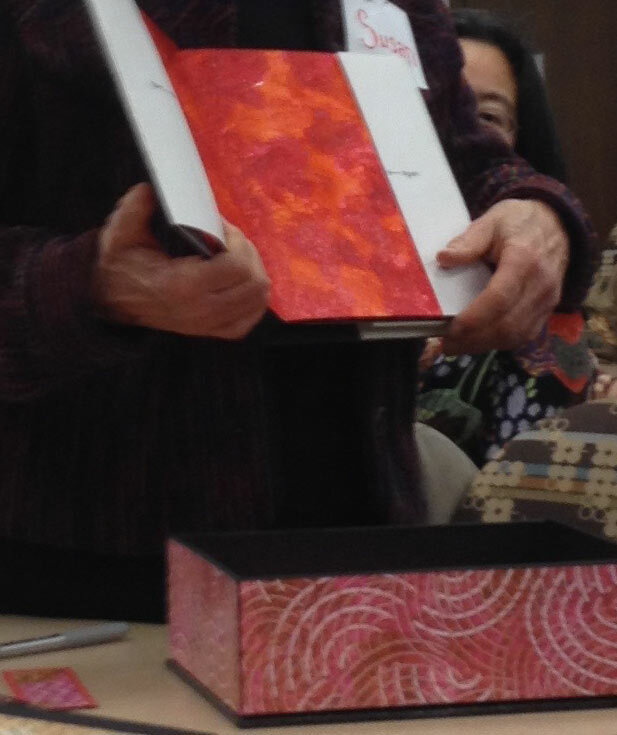 Susan Callan brought books of paste paper and talked “how-to” using paste and water media. It seems to be very strong. And it looks a lot like too-much-fun. Oola and I will give it a try. Much more was shared but either my photos were no good, or my memory is faulty, or I am just running out of time. I want to thank Susan Brown, whose book is her masters thesis, full of fascinating stuff about urban planning, “vital text” in petroglyphs and on gravestones, Queen Victoria of Seattle, the role of the UK in the evolution of the Northwest, and finally my better understanding of why people are so respectful and helpful, at least where I live on the peninsula. I thought it was the influence of the Canadians, and it seems that I am maybe at least partially correct. 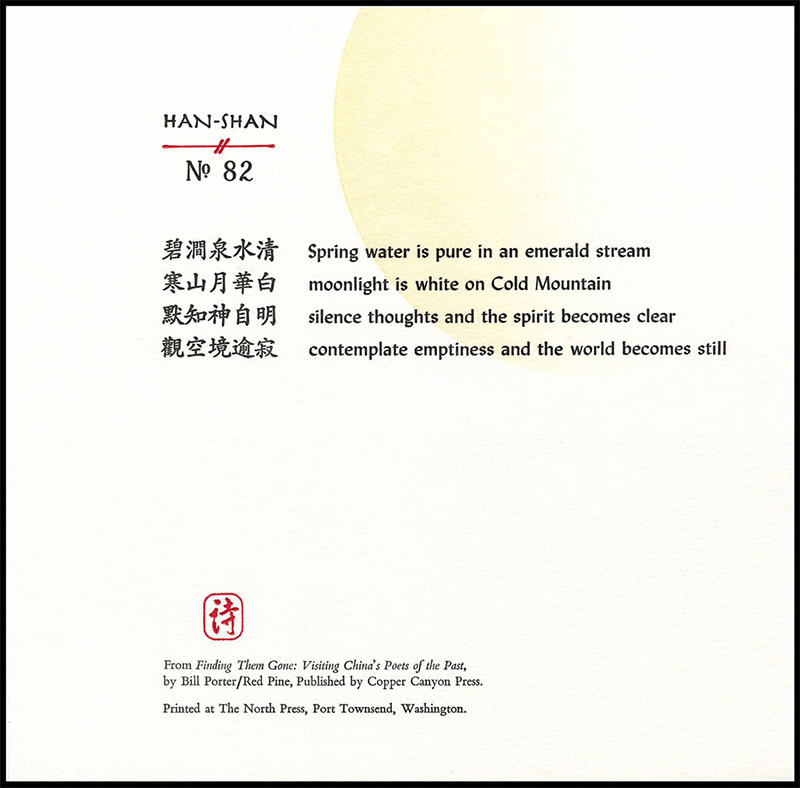 I also want to thank Lisa Leong Tsang calligrapher/anaplastologist. Book people are good, strong, and surprising people. I am so happy to be meeting this community in my new digs on the planet. This is a great Trip. As a bookmaker and typesetter of 47 years, though, in a latent state for the last 7 years, it went straight to all the printing ink in by blood. I am sure (and hope) that those working with hand-set type work safer today then when I discovered a Columbian Eagle Press and many drawers of type, while an undergrad at Ohio University. Nobody knew what to do with the stuff and I taught myself, while crushing a fair amount of type, before figuring out how to correctly set the pressure. Just went up on line and found some Columbians for sale, as well as Vandercooks. You need to add them to your studio. I will get to every one of the links you provide. Yes! you have to make paste paper, it is great fun, and produces wonderful results from the very first attempt. I hope that there were some bookmakers of lesser years, and that you just were not able to photograph them. The year I spent at the University of Alabama, on a Post Graduate Fellowship, at the University Library, had a good number of individuals in their 20’s. I hope they are still making books. 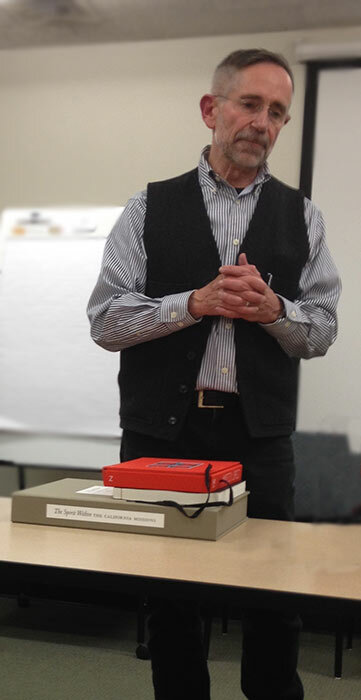 I know that a number found jobs at small press, and one, his name just disappeared from my brain, who had both a Masters in Library Science and Bookbinding, became the head of the area of hand-made books, papers, etc., at the main library branch in San Francisco. He had had a small press in the S.F., but could not make a living, and took the library position. Have no idea if he is still there, but I guess I am a wee bit late in telling you this. Google Ke Francis, if you are not familiar with his work. 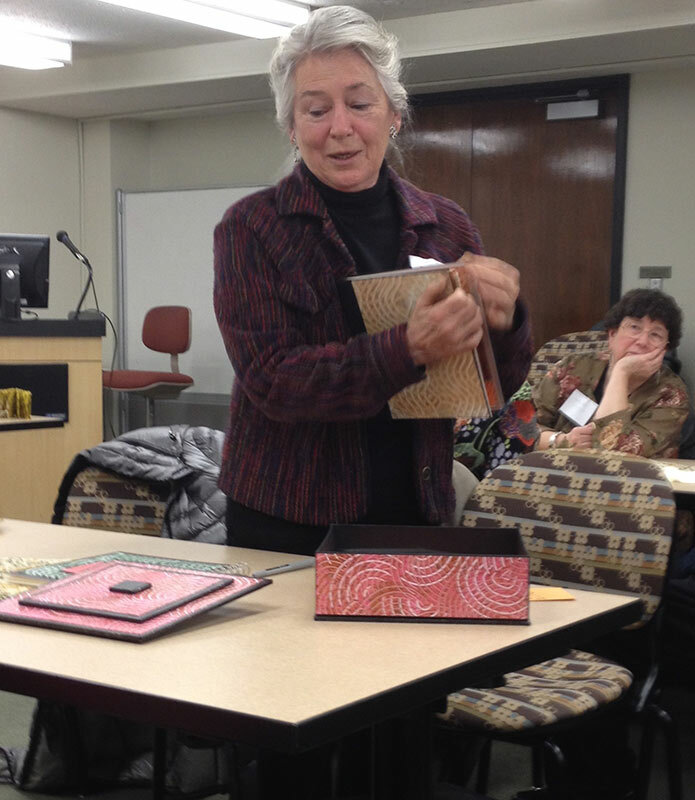 Still teaches at Central Florida University, and has Hoop Snake Press. Met him in Tupelo, MS, when I was on the road, working as Assistant Director of Admissions for SAIC. Was living on his grandmother’s old cotton farm, and was close to starving. Was invited to stay for a few days, and he drove me all over the county, and of course to the house where Elvis was born. We were in contact for a good number of years, but it is so hard to stay attached to 100’s of people. Looking through an old address book, just found two old addresses for you. Am happy that you have connected with all these bookmakers in your new spot on the globe. Also, that you are among friendly folks.